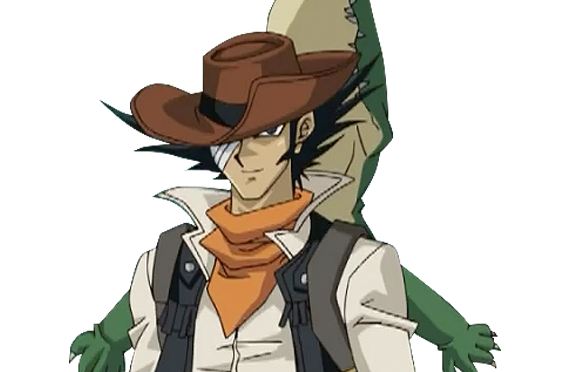 Jim Crocodile Cook – is a new student hailing from South Academy who enters Duel Academy in the third year. Well-versed in earth science and dueling, Jim serves as an ally to Jaden Yuki and the others. Jim is an expert geologist and archaeologist, having taken part in an excavation of a Tyrannosaurus in the past, and has a crocodile named Shirley (Karen in the Japanese version), initially believed to be a fake by Vellian Crowler and Bonaparte, who he carries around in a specially made backpack wherever he goes. Jim regards Shirley as “family,” and does not consider her a pet. He places great trust into Shirley and often uses her as a judge of good character, which started his friendship with Jaden Yuki. Jim wields a Duel Disk in the shape of a boomerang. After saving Shirley from an animal trap, Jim injures his right eye. After regaining consciousness, he is imbued with the Eye of Orichalcum by a man touched by Jim’s devotion to Shirley. The man who gave it to Jim told him it was supposed to have incredible powers when in the presence of a special comet. Afterwards, he keeps his right eye bandaged. During the Duel between Jaden and Axel, Shirley began acting strangely due to electromagnetic waves coming from within the jungle. Meeting up with Jaden and his friends after Shirley inadvertently attacks Tyranno Hassleberry the next day, he and the group venture deep into the woods to investigate. Seeing another opportunity to claim duel energy, Professor Viper reactivates the signals, causing Hassleberry to act wildly and face Jim in a Survival Duel. Hassleberry quickly regains his senses and lashes out at Jim for disturbing his dinosaur monsters, but is eventually defeated. After Viper’s defeat, Jim is one of the few students that aren’t turned into zombies when the academy is transported into the desert. Jim accompanies Jaden and co. to an alternate dimension and assists them in defending Duel Academy from zombified students. After their journey into a third alternate world, Axel and Jim face Jaden, who has turned evil and begun calling himself the “Supreme King”. Jim duels him in a desperate attempt to bring back his friend from the dark side, using his Orichalcum Eye to see into his heart, where it is revealed that the Supreme King is actually an entity that has possessed Jaden. Despite his discovery and attempts to free Jaden, Jim loses and both he and Shirley disappear, leaving his Orichalcum Eye to fall into Axel’s hands. 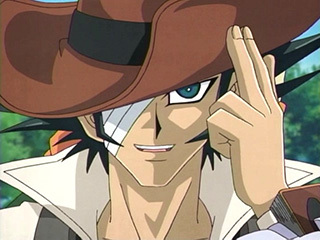 He is later discovered to be alive, and held prisoner with everyone else who died in the Duel Spirit world in an alternate dimension by Yubel, and subsequently returns to his academy in episode 157. Jim plays a Fossil Deck. His strategy relies heavily on the use of “Fossil Fusion” to remove from the game the monsters in both his own and his opponent’s Graveyards to summon creatures of varying strengths dependent on the levels and types of the Fusion Materials used for the merger. The monsters created by “Fossil Fusion” follow “reverse evolution” through the Cenozoic, Mesozoic, and Paleozoic Eras; the more ancient the monster, the more powerful it is.